Although New Forest ponies are referred to as ‘wild’ the herds are actually a mixure of semi-feral and domesticated animals that are owned by local people with Rights of Common. Without doubt one of the best things about visiting the New Forest is seeing the ponies that inhabit the heathland, woods and lawns wandering freely about. Although the New Forest ponies are often referred to as ‘wild’ this is not, strictly speaking, a true description. 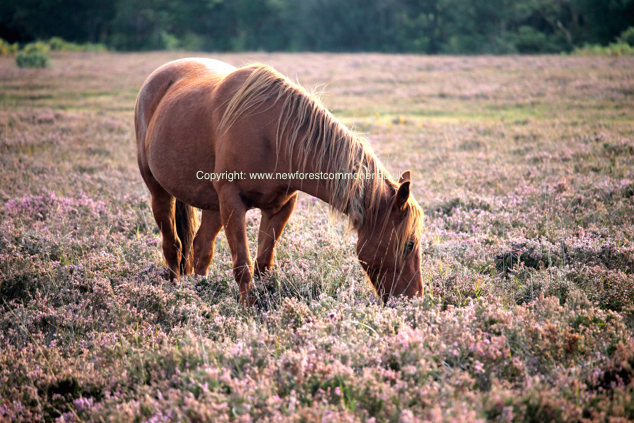 Wild horses are ownerless and untouched by human hands, whereas every free-roaming pony on the New Forest is owned by a local person with Common Rights, and will have some degree of contact with, or frequent exposure to, people. The New Forest pony herds, rather than being wild, are actually a mixture of semi-feral animals that are wary of the presence of humans: and domesticated stock that do not fear them. One of my commoning friends spent much of their childhood in the company of their family’s free-roaming ponies. They would take a bridle with them onto the Forest catch up one of the ponies, which they knew to be domesticated and safe to ride, and climb up onto its back. After galloping around, jumping the heather and generally having a good time, they would ride home and release the pony to make its own way back to its territory and herd-mates. In times past, before the widespread use of the motorcar, it was not unknown for commoners to ‘borrow’ one another’s animals. If they needed to hitch up a cart for a trip into town and a neighbour’s pony was conveniently close-by they would use that rather than going in search of their own. Such was the level of co-operation and reciprocity between the commoners. It also helped that they were able to recognise each other’s stock and know which ponies were workable and which ponies were not. This was usually as a result of horse-trading or swapsies between each other. The often-repeated assumption that New Forest ponies are wild and ownerless has led people to commit ‘horse-rustling’ and actually steal one. Many years ago a little girl was found leading a very tame pony from off the Forest, along one of the main streets in town, towards a housing estate. A commoner, who happened to be passing, recognised the pony and asked the little girl where she was taking it. “Home”, of course was her reply. Like all little girls she had wanted a pony of her own but hadn’t realised that she had chosen one that was actually the property of someone else. Of course, the pony in question seemed very willing to follow her. Such is the biddable and friendly nature of the New Forest pony once it is properly trained! The pony was, of course, promptly returned to its owner and the Open Forest where it belonged. However, other incidents of ‘horse theft’ are much more disconcerting. Last April (2014) two men were seen bundling a miniature Shetland pony mare into a dark coloured van, parked on the verge of the Lymington to Beaulieu Road, (B3054) between Bull Hill and Norley Wood Cross Roads. The pony in question, like all the free-roaming New Forest ponies was micro chipped and branded with its commoning owner’s identification number. It is believed that this, and the publicity surrounding the theft, may have persuaded the thieves to return the pony because several weeks later she reappeared close to Hatchet Pond, not far from where she was taken. Police are still appealing for information about the identify of the thieves. Every free-roaming pony on the New Forest is owned by a local person with Common Rights. This entry was posted in New Forest, New Forest Commoner, New Forest pony and tagged Common Rights, Commoner, domestic, horse owner, horse rustler, horse thief, New Forest pony, owned, semi-feral, thieves, truth, wild pony. Bookmark the permalink.